Some were frustrated because they were unable to pay money online and transfer money. Others could not confirm whether money was in their account. 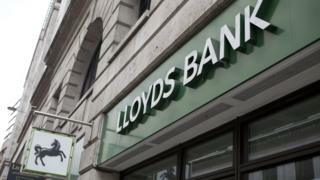 A spokesman for the Lloyds Banking Group, which owns the three brands, apologized, but said the systems are now up and running again. "However, today's issues can lead to delays in processing some of the payments customers made earlier in the day, and we continue to advise customers not to make a second payment to avoid processing duplicate payments." The bank said that due to the IT problem, no customers would get out of their pockets. Steve Davis, a quality engineer from Leicester, said he was caught by the problems this morning when he was told that a customer's money had been transferred but was not displayed on his Halifax account. "I got a notification about a transfer from [banking] App ... at 11 o'clock it had not appeared. Then it was not published at noon ". Mr. Davis said it was not until he called his bank that someone told him about the IT outage, which he said was "fixed at 3:00 pm". "What was most annoying was that nobody told us anything ...[they] just leave us in the dark ". "They have people on tight budgets who are in the check-out queue this evening and think a payment has been received, but it will decrease."